Step 1 – Cut 2 chenille stems into thirds. On the inner ring, bend chenille stem in half, twist it 2 times. It doesn’t matter what color of chenille stem that you use. The chenille stem will not be seen on the front of the wreath. 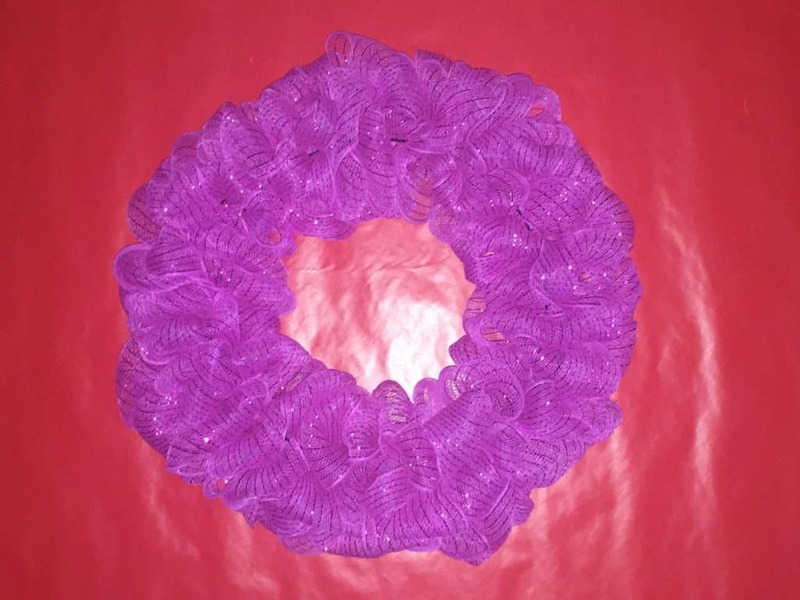 Step 2 – Bring the end of the mesh from up under the wreath ring, twist the end of the mesh and add it to the chenille stem on the wreath ring, twist it securely. Step 3 – Pull a 3-4 inch loop in between the bottom two wires. Hold the loop. Make another 3-4 inch loop between the next two wires. Do the same in between the middle and first wires. This will start your 3 rows of loops. You want to do this all the way around the wreath ring. It will tighten up to where you will no longer have to hold them after you have made 6 or 8 loops. 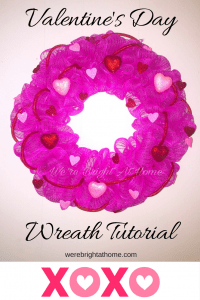 Shorten the mesh loops if you want the wreath to be less puffy, make them longer if you want the wreath puffier. Try to pull the mesh taut in the back without tightening it. It will pull your loops out. Don’t worry about what the back of the wreath looks like. Using this method leaves it pretty neat. 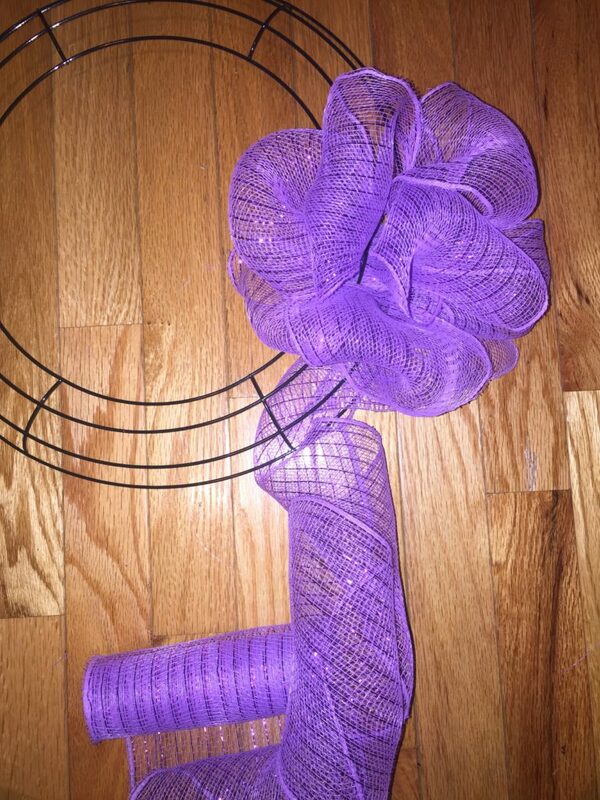 Step 4 – Finish going around the wreath with the mesh. 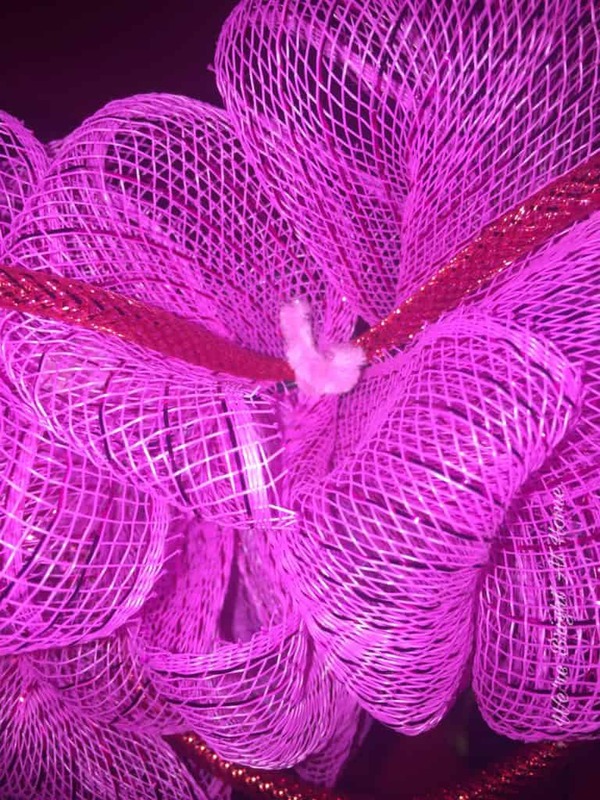 Don’t worry if you can see any of the wreath ring through your mesh. You can fill in those spaces with decorations. Just make sure to try your best not to have any big gaps. Step 5 – Decorate. Add the mesh tubing. 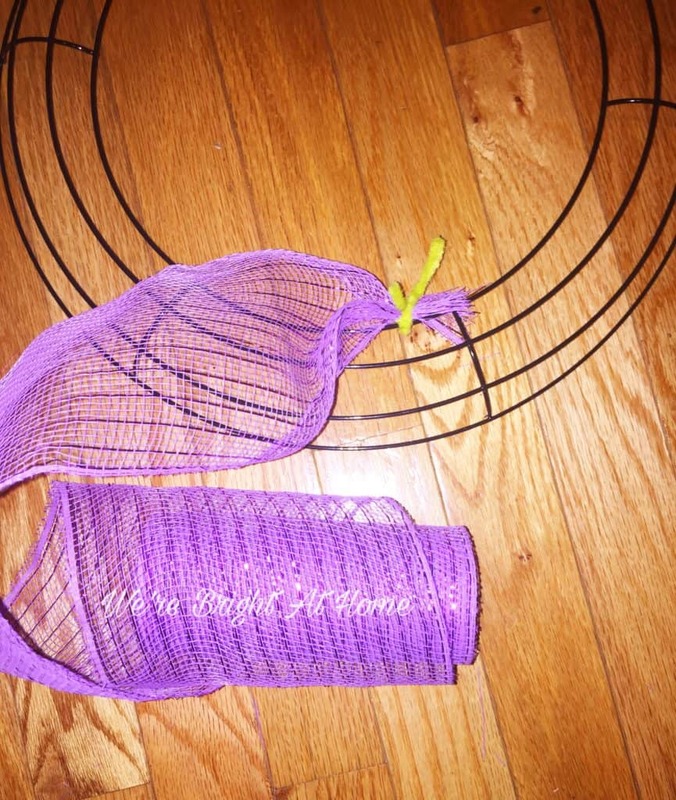 Fasten the mesh tubing using a chenille stem the same way you fastened the mesh. Measure how long you want the mesh to be in between tying it down. I fastened the tubing down every 6 inches. I try to cover any wire that’s showing by fastening the mesh tubing over it. Cut the stick off of the glitter heart picks. 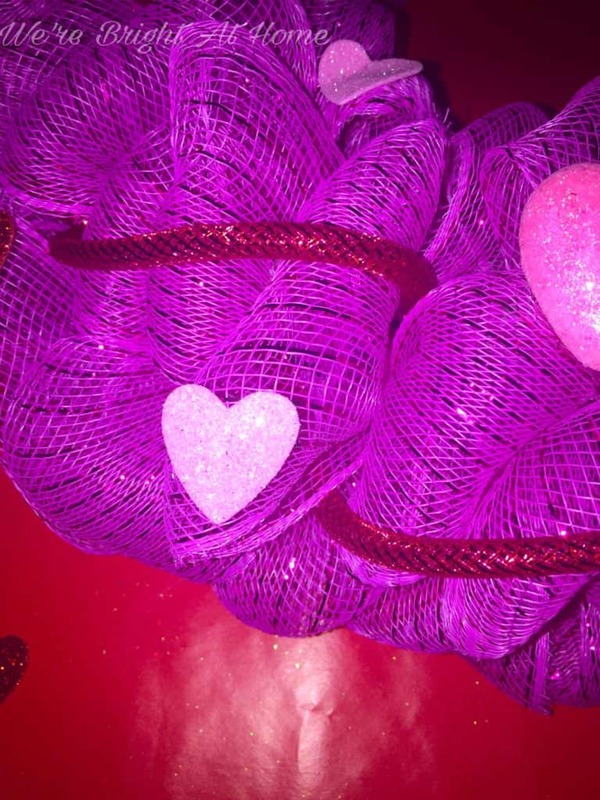 Use your hot glue gun to glue the hearts where you want them. Do the same with the foam hearts. As you are gluing the hearts into place, kind of look at your wreath and see if you see any bare spots. If you have any abnormalities you can glue one of the decorations over it. This project is very forgiving. That’s it! 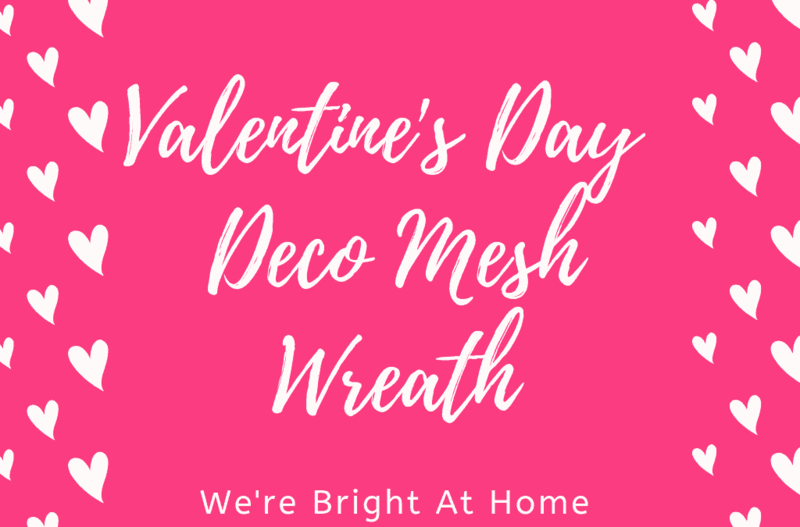 You now have yourself your very own deco mesh wreath for Valentine’s Day! There are many options that you can add to these wreaths. Some options are signs, ribbon, plastic Christmas ball decorations, etc. You can add as much decorations to these wreaths as you want. 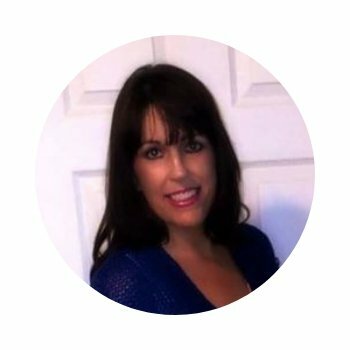 It makes them look nicer, fuller and more professional. All of the items that I used for this tutorial came from the Dollar Tree. The majority of my craft supplies are purchased in bulk online. I love that I can save on shipping costs and have my items shipped to my local store. FREE* Shipping To a Dollar Tree Store! Pick It Up At Over 5,000 Locations! *Restricitons may apply. I hope you had fun! Ahhh, you’ve inspired me to give this a try – beautiful!!! Thank you, Martha! 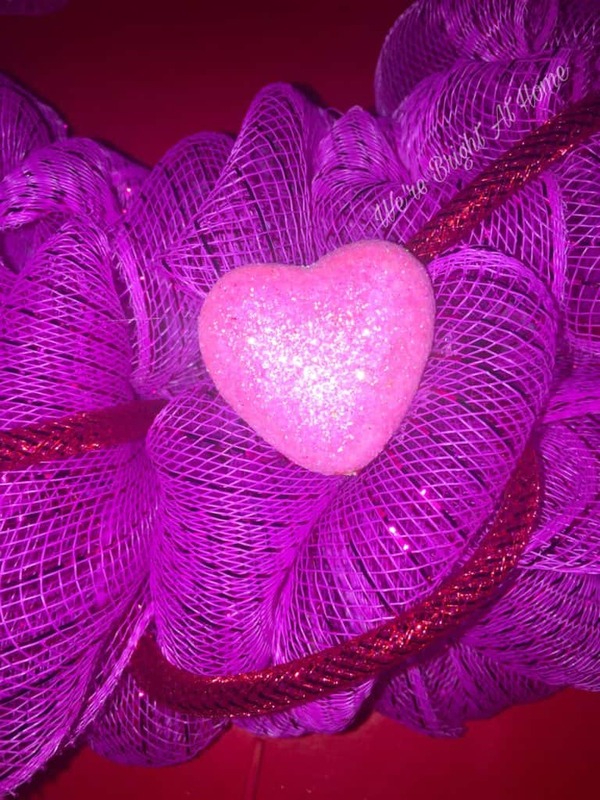 I will be making another Valentine’s Day wreath very soon. Come back and check it out. Be sure to take pictures and post them here so we can see your awesome creation!